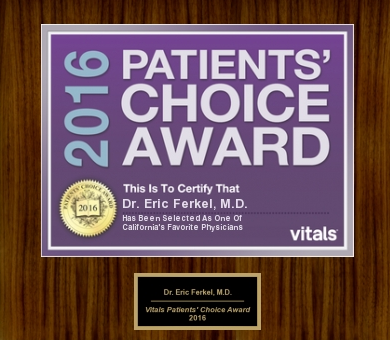 Dr. Eric Ferkel Honored With 2016 Patients' Choice Award! Our very own Dr. Eric Ferkel was recently honored with the prestigious 2016 Patients' Choice Award! Vitals Patients' Choice winners are chosen based on the number and overall rating a doctor receives from patients for the calendar year. The algorithm also takes into account other quality metrics that the provider must meet. Only 7 percent of doctors were eligible for a Vitals Patients' Choice Award this award season. Join us in congratulating Dr. Eric Ferkel on this great achievement!